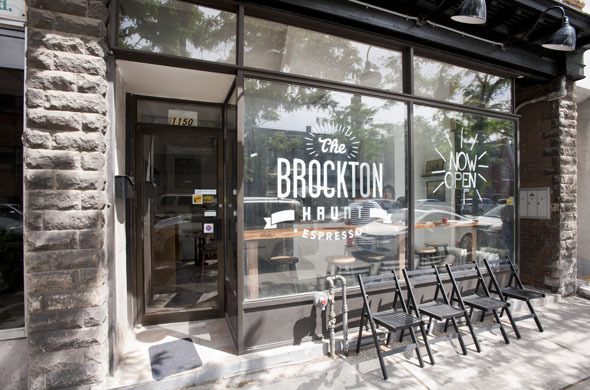 The Brockton Haunt is a new café on College just west of Dufferin, but it feels much more like a friend's kitchen than a café. It's bright and airy, with white walls and earthy wood furniture, and lots of clustered group seating in various corners. 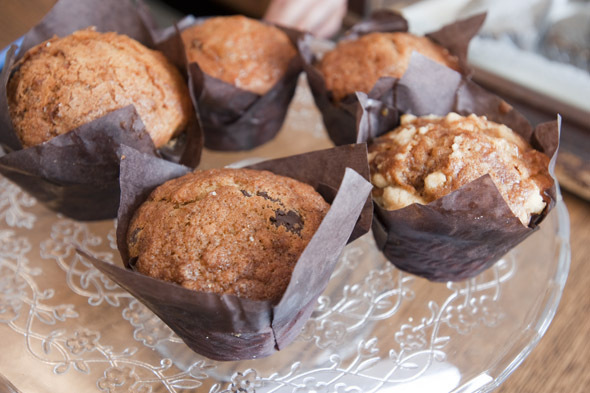 I order an Americano ($2.25) and a thick slice of banana bread ($2.00) that tastes exactly like my Nanny's, and cuddle in to a cozy back corner to write. 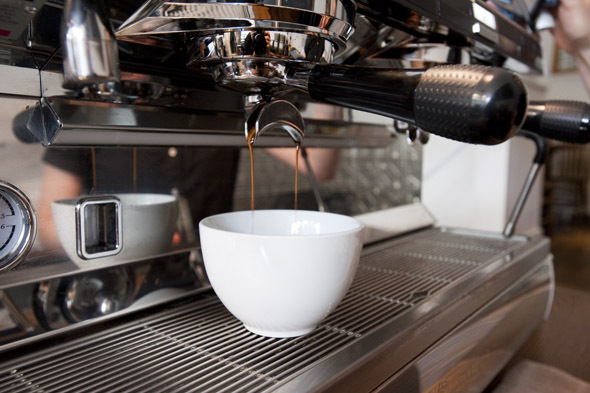 The Americano, made with Pilot's "Big Brother" beans and pulled from a Nuova Simonelli machine, is just what an Americano should be, for the most part. It tastes strong enough to bring a zombie back to life, which I appreciate in a coffee. But it's not especially hot when it's served to me (read: it's on the hotter end of 'warm'), so that's a bit disappointing. But, as I sit and hang out, a man actually comes in and fixes it, so kudos to them for being on top of things. 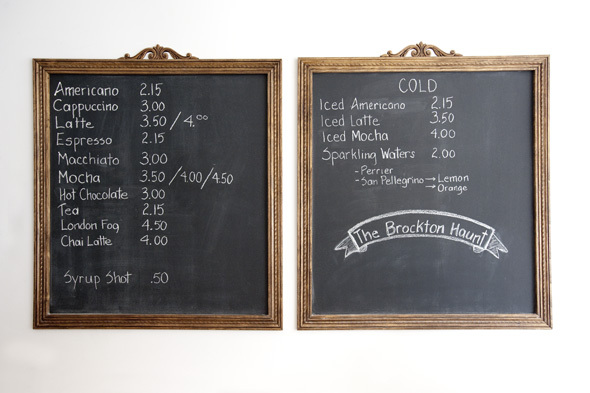 The menu at The Brockton Haunt includes just about everything you'd expect from a cafe: a selection of teas, sweet treats like cookies and butter tarts, and all of the coffees: lattes ($3.50), cappucinos ($3.00), etc. They don't have anything in the way of savoury treats when I visit, though, which I find a bit saddening, since it's around lunch time. I know what you're thinking. 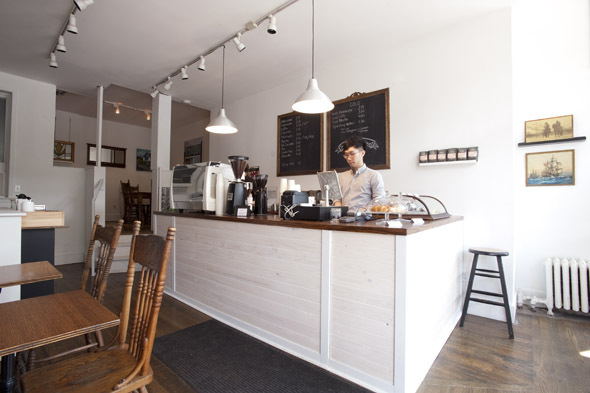 There are loads of cafes dotting this stretch of the west end already (including, but not limited to, The Common , Bivy , The Hogtown Cure , Slow Room and Holy Oak ). But I think there's a surplus for a reason. When there are only a few cafes in a given area, it can be impossible to even find a seat. There's room for about 15 people to sit, so it can be intimate without being too small. The Brockton Haunt does have a similar vibe to some of the other spots in the area, but its staff seem friendlier than average. 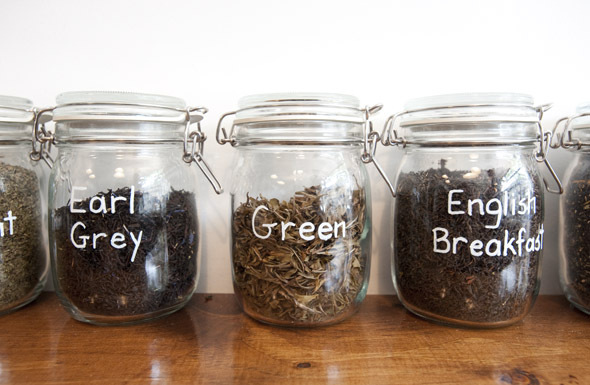 There's not an ounce of the snotty barista vibe about them. And there are definitely enough people in the area to support another café, as proven, to me, by the steady stream of people who visit all afternoon as I sit and write. The Brockton Haunt just opened on the weekend, but the word seems to be out already. Their hours are still being sorted out, as they're trying to get a feel for what the community needs. They plan to be open from roughly 7 p.m. to 5 p.m. for the time being, and you can check out their Facebook page for updates in the meantime.